From the creators of Hungry Shark Evolution, Hungry Dragon is the latest offline time killer game for mobile devices. Ubisoft has just released this game for Android on Google Play Store and the game challenges you to unlock all the dragons and top the rank on the leaderboard by achieving the super high score. And if you are looking for some tips or tricks to unlock all the dragons, pets, special pets fast, then you are on the right page. 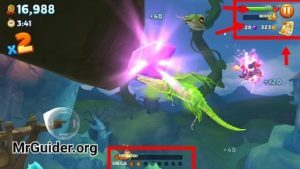 In this post, we have shared everything about the game you need know: Hungry Dragon guide and Hungry Dragon cheats, tips & tricks. Fire Rush: – In Hungry Dragon game, fire rush is a special skill that the dragon gain when the fire rush bar gets full or reaches the maximum point. At the bottom-center, you can check the status of fire rush. To charge it, eat the animals or birds or creatures. Tip: – Eat the red chilly to charge fire rush fast. In Fire Rush mode, the dragon uses his fire ability to destroy the creatures. It also fills up the life & boost bar. Mega–Fire: – After activating 8 fire rush, Mega-Fire Rush ability of the dragon gets activated that allows you to burn any type of prey. So this is the basic of Hungry Dragon game for the beginners. Now, let’s learn more about the game in the ultimate Hungry Dragon game guide and after it, check out the top class Hungry Dragon cheats, tips & tricks to master the game. In this part, we will learn about the pets, special pets, dragons, costumes, golden egg, and much more. Make sure to pay attention to all the parts. Nibbler is the first dragon you get in Hungry Dragon game whose rank is xS. Its stats are very poor in comparison to XL, M or L rank dragons. All the dragons(xS rank) can equip only 1 pet(pet guide is below). And they get 2X multiplier(Score points, rewards) in fire rush mode. These dragons are better than xS rank dragons as their life and boost up speed is better. They get 3X multiplier bonus during the fire rush mode. They can partner with up to 2 pets. List Of S Dragons: – Mad Snax, Sparks. They are giant dragons and better than S-rank and xS Rank dragons. Some highlights: – a 4X bonus in fire rush mode, can equip 3 pets. List Of M Dragons: – Don Drago, Jekyll & Fired, Zhe Long. With 5X bonus in fire rush mode, the potential of keeping 4 pets, L-Rank dragons are the best dragons in comparison to all the dragons listed above. List Of L-Rank dragons: -Blaze, 2 Secret dragons. XL Dragons are very giant and can easily destroy the giant enemies. But you need to discover them by unlocking all the dragons(XS, S, M, L). How To Unlock Dragons In Hungry Dragon Game? In Hungry Dragon game, these pets activate the bonus; food, speed, health, score, fire, defense, and more. All the dragons can equip the pets and enjoy the buff. How to get the pet in the game? First of all, you need to find the egg; play the game, explore the map and you could find an egg while exploring. Once found, go to the dragon selection screen -> at the bottom-center, tap the incubate button to hatch the egg. Hatching takes time. After a certain amount of time, open the egg and get your pet for free. How to equip? First of all, select the dragon. After it, tap the pets button(bottom-left side). Select the pets. Read the dragons guide above to find out how many pets a dragon can equip. Special Pets provide massive bonus/buff or unique bonus/buff to the dragons. But In Hungry Dragon game, it’s very hard to get these special pets as there is only one way; open the golden egg. Costumes also activate the bonus. How to get a costume? Level Up the dragon. How to equip costumes? Go to the main screen of the game -> tap the costume button(bottom-left side) -> select the costume. So this is the Hungry Dragon guide for the beginners. Now, let’s head to Hungry Dragon game cheats, tips & tricks. 3RD Way: – Connect or link the game to your Facebook account and claim 15 gems. 4TH Way: Find the chests. So these are some ways to get free gems. If you know another source, please submit the cheat here and we will publish it here. At the top-right corner, there would be a map icon. Tap it to take a deep look into the whole map. You can figure out the location of chests, eggs, alphabets using the map. These chests include coins; coins are used to unlock the dragons or costumes. You need to avoid the bombs or poisonous creatures as they can reduce the life of the dragon. Don’t waste gems to open the incubate instantly or for the costumes. Save, Collect, and use to obtain a secret/premium dragon. Yes, you can play Hungry Dragon game offline. But we would recommend you to turn on the internet connection. Why? Because you can resume the game and restore the dragon’s life by watching a video ad. Tap the map -> at the bottom of the map, there should be two options. You can either watch the video ad or spend gems to reveal the secret location. Pay attention to these missions and complete them if you need a huge amount of coins for free.